We are pleased to announce the establishment of a new Fists chapter, Fists East Asia, with 20 Fists members in Taiwan and Japan. The Fists East Asia team would like to thank Geo, Ralph, Nancy and others for offering a great deal of assistance in establishing this new chapter. less-experienced operators learn and improve CW proficiency. During the first year, membership reached 300, most of whom were in Great Britain and Europe. The North American chapter was formed in 1990 to assist 11 members in the USA receive the newsletter and as a banking convenience. Nancy Kott WZ8C of Hadley, Michigan was named US representative, a position she still holds but she now handles the affairs of over 2,000 members in the Americas. The NZ Chapter was formed in 1998 to provide a similar service to Australasian members, with Ralph Sutton ZL2AOH as the VK/ZL representative. From a VK/ZL membership of four, there are now over 70 members "Down Under", principally in New Zealand. The NZ membership is the largest in any country outside England and Wales and North America. The East Asia Chapter was formed in 2004 by a few BVs and JAs to provide East Asian members with various services in their native languages. World wide, FISTS members now number over 5000 members, growing by up to 100 each month. 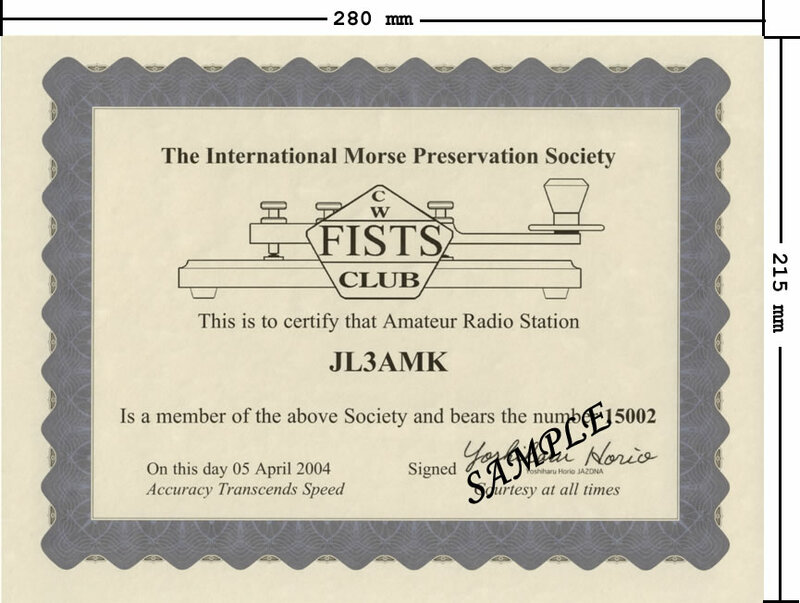 The FISTS Club is one amateur radio's fastest growing organisations. It's an unique club, founded and maintained on solid principles using radio's oldest and yet most reliable communications mode - CW! Worked FISTS all US States - for exchange between FISTS members in QRP as well as QRO categories. FISTS operate the QSL Bureau in the Europe, Down Under and East Asia for the quick exchange of QSL cards between members. FISTS members are young, old, both OMs and YLs, - they live all over the world including every State in the USA, hold every licence class, (while in fact some are prospective licences and SWLs) and all enjoy CW communications at widely varying proficiency levels. Requirements for membership of the FISTS Club are very simple. One simply has to like Morse code! You do not need to be a member of any other organisation and there is no minimum Morse proficiency requirement.